Tulegur describe themselves as a modern nomad music duo. 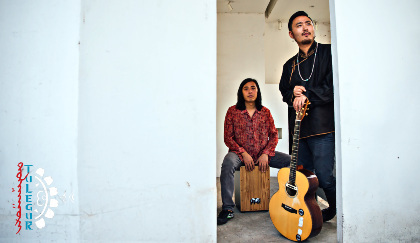 They are part of the growing new wave of music developing from the mutual fascination between the wide open spaces of the Inner Mongolian grasslands and the sprawling urban intensity of Beijing. Vocalist/acoustic guitarist Gangzi spent over a decade as a solo artist, travelling between the two locations honing his khoomei throat-singing skills and his rock guitar chops. In 2014 he joined up with percussionist/electric guitarist, Zongcan. 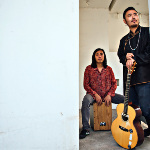 Together they create a driving, innovative mix of traditional Mongolian music, acoustic rock, throat-singing and electronic music, variously described as “ethnic post-rock” or “psychedelic nomad rock”. Whatever it is, they’ve already rocked some major international festivals including WOMAD (UK, Australia and NZ), IndiEarth (India) and the Iomma & Sakifo Festival in La Réunion. Definitely more to come.